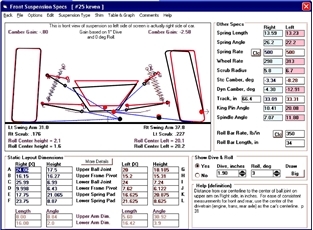 The roll center calculator lets you input, view, save, analyze and compare either double a frame or McPherson strut front suspension geometry. The options for entering your geometry specs include: enter X & Y coordinate (distance and height from the cars centerline at the ground), enter X & Y coordinates and angles and lengths of arms, retrieving one of the examples which come with the program. Once entered, the program will display calculated parameters like instant centers, roll center, king pin angle, wheel rate, scrub radius and camber gain (the amount camber will change for a certain amount of dive and or roll). Then click on yes to show dive and roll and adjust dive and or roll and watch roll center and instant centers move, camber change, and spring deflection. Spring deflection is useful to reproduce track conditions shown by your shock indicators.